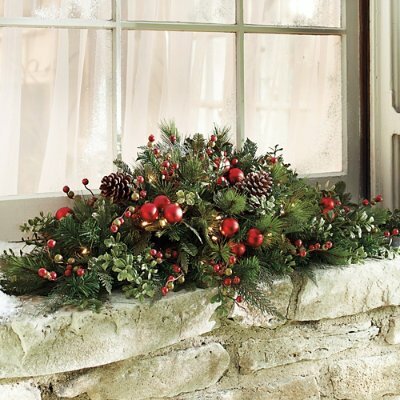 Cordless pre-lit window swags with a rich mix of greenery, berries and lightly frosted pinecones. Accented with red ball ornaments and twiggy tendrils. Designed for display indoors or out. All pieces are pre-lit with bright white, battery-operated LED lights. Equipped with an integrated 6-hour timer, so it illuminates at the same time every day. Illuminate your windowsills with the wondrous mix of our MacKinley Cordless Window Swags. This lush and life-like arrangement of greenery, berries, lightly frosted pinecones, twiggy tendrils and metallic red ornaments is designed to go anywhere, indoors or out. And since it's cordless and made to live indoors or out, you can display yours anywhere you like, from a third-story window, to a window in the barn. . . . . . Each requires four D batteries (not included) . Shaping is required to achieve a full and lifelike look. To display window swags, simply close the satin ribbon in your window . A Grandin Road exclusive.